College Football Playoff final: Urban Meyer’s Ohio State is set to be a perennial title contender. 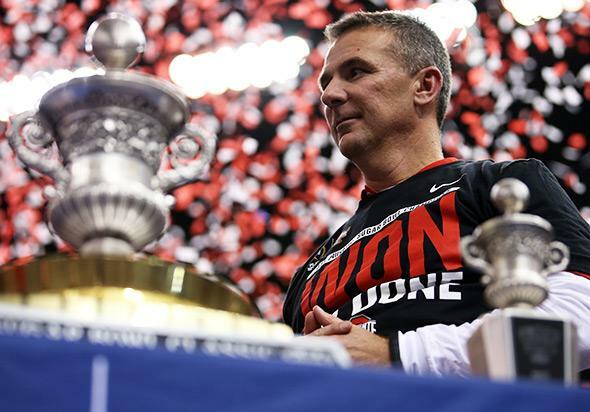 Why Urban Meyer’s Ohio State is set to be a perennial title contender. Ohio State head coach Urban Meyer celebrates with the Sugar Bowl trophy after defeating Alabama on Jan. 1, 2015, in New Orleans. A once-proud college football program was in shambles. In need of a dramatic, face-saving rescue, the school turned to a proven winner with local ties to turn things around. Success came quickly, and soon—defying expectations—the team was playing for the national championship. The parallels between this season’s Ohio State team, an underdog to Oregon in the first-ever College Football Playoff final on Monday, and the one that shocked Miami in the 2003 Fiesta Bowl don’t necessarily foretell a similar result as 12 years ago. But whatever happens in Arlington, Texas, on Monday, Urban Meyer’s restoration project appears poised for more success than his title-winning predecessor Jim Tressel. It’s worth noting the similarities between the two coaches, and the two teams, before going into why Meyer’s tenure feels more promising. Meyer and Tressel are both Ohio natives and were both Buckeye assistants early in their careers. Meyer is in his third season in his first title game with OSU, and Tressel was in his second when he won the national championship. Both were tasked with rescuing the Buckeyes from turmoil: Meyer coming in after a memorabilia-for-tattoos scandal and cover-up that cost Tressel his job, and Tressel himself having been hired in 2001 because the previous coach had gone 2-10-1 against Michigan, with zero national titles (far greater sins in the eyes of Buckeyes fans than any NCAA violations). In 2002, the Buckeyes were considered a year away. They were talented enough to win the Big Ten, but not much else. They had a good defense, but an unproven offense. In 2014, OSU was ranked anywhere from No. 3 to No. 7 in preseason polls, but quarterback Braxton Miller’s season-ending shoulder injury had pundits and fans alike starting up the same “just wait until next year” chatter. Fox Sports called it the Buckeyes’ “most crippling” injury since 1985. Sports books dropped their odds of an OSU national title from 12-1 to 50-1. The 2002 team started the season ranked 13th and steadily climbed to No. 2 10 games into the year and claimed a spot in the title game by eking out a 14-9 come-from-behind win over Michigan in the regular-season finale. This season, OSU dropped as far as No. 23 after an embarrassing 35-21 loss to Virginia Tech in the second week of the year. After losing another QB—second-stringer J.T. Barrett in a win over Michigan—the Buckeyes needed a stunning 59-0 win over 13th-ranked Wisconsin in the Big Ten title game to sneak into the inaugural college football playoffs. That, however, is where the similarities end. Comparing the two teams offers a case study in how the college game has evolved and shows how Ohio State, regardless of what happens against the Ducks on Monday, is in a better position to stockpile national championships in the future than it ever was under Tressel. Tressel’s conservative style—for example, his belief that “the punt is the most important play in football”—was good enough to lead the Buckeyes to six Big Ten titles (and an all-important 8-1 record against Michigan). It was even good enough to end Miami’s 34-game winning streak in the 2003 Fiesta Bowl, billed as one of the greatest games in college football history. In that title game, pundits didn’t give OSU a chance against a Miami team that was heralded as one of the best ever. But the defense limited the Hurricanes’ powerful offense, causing turnovers that led to both of Ohio State’s touchdowns in regulation. With the help of a controversial pass-interference call that gave OSU a new set of downs at the end of the first overtime, the Buckeyes were able to tie the game 24-24 before going on to a 31-24 victory and the team’s first national title in more than 30 years. The stats from that game make it sound like one that could have been coached by Woody “3 yards and a cloud of dust” Hayes. Ohio State’s four touchdowns came on runs of 1, 7, 1, and 5 yards. The Buckeyes gained 267 yards of offense for the entire game (or, just 37 yards more than Ezekiel Elliott gained all by himself against Alabama last week). Buckeye fans reacted euphorically, predicting future championships. But it wasn’t to be. The game was changing. Ohio State was good enough to play for national titles, as it did following the 2006 and 2007 seasons. But the Buckeyes weren’t good enough to win them. Both games were dismal affairs, as the team lost to Florida (and yes, Urban Meyer) 41-14 in the 2007 BCS title game and to LSU 38-24 in 2008. The SEC’s rise to dominance, as others have noted, began with that Florida–Ohio State game. Conference schools were adopting more up-tempo spread offenses and attracting recruits who saw that as the path to the NFL. Meyer’s victory with Florida was the first of seven straight BCS titles for SEC schools. Just as Ohio State needed a bit of ugly luck to win that 2003 title, it was a set of unpleasant but fortuitous circumstances that allowed the school to hire one of the architects of the SEC empire. Meyer resigned from Florida in 2010, citing family concerns. Tressel completely mishandled the 2010 NCAA investigation into whether Ohio State players traded memorabilia for tattoos and other benefits, covering up what he knew, and resigned in disgrace in 2011. Tressel was successful enough—and beloved enough—that without that scandal, Ohio State would have gone on beating Michigan consistently, winning the Big Ten regularly, and doing a mediocre job in important bowl games until he retired. But if Tressel was the man to restore the Buckeyes to regular national title contention, Meyer has already proved he’s the man to carry the team beyond that. He’s intense, he’s emotional, he’s a gutsy play caller, and his teams reflect that. When J.T. Barrett broke his ankle in the regular-season finale against Michigan, Ohio State could have easily folded. The Buckeyes were going into the Big Ten championship with a third-string quarterback. The media wondered whether Meyer would have to limit his playbook so that Cardale Jones would be able to get through the game. But how did Ohio State open against Wisconsin? With a six-play, 77-yard drive that ended when Jones and wideout Devin Smith connected on a 39-yard touchdown pass. He later added touchdown passes of 44 and 42 yards. In the next game, against one of the best defenses in the country, the team went on to score 42 points against Alabama. This was the second-most yardage that top-ranked Alabama had allowed all year. You could look at lots of stats to show how Ohio State has changed under Meyer (the 509 yards of offense per game this year, as compared with 384 yards a game in 2006, arguably Tressel’s best team), or you could just watch this play. Down 21-13 against Alabama in the second quarter and with just seconds remaining before halftime, OSU uncorked a flea flicker. Wideout Evan Spencer hurled a 13-yard pass to Michael Thomas, who landed only millimeters in bounds. Ohio State seized the momentum and never really gave it back. What will Monday night’s game look like? Will the defense that wasn’t able to shut down Alabama’s Amari Cooper (who had nine receptions for 71 yards and two touchdowns in the Sugar Bowl) be able to contain Heisman winner Marcus Mariota and an offense that averages 552 yards a game? It’s hard to say. Maybe Oregon’s unheralded defense will be the first to contain Ohio State’s breakout running back Ezekiel Elliott, and we’ll even see a repeat of the Ducks’ 59-20 Rose Bowl blowout of Florida State. I wouldn’t bet on it, though. In fact, don’t be surprised if, like 12 years ago, the Buckeyes pull off another miracle upset. Whatever happens, thanks to Urban Meyer’s rapid transformation, there really is a next year.